This undated handout artist rendering provided by the Shell Oil Company shows a graphic of Shell's Alaska subsea containment system for those water depths. ANCHORAGE, Alaska – The federal agency overseeing offshore drilling in Alaska says the worst-case scenario for a blowout in the Chukchi Sea lease could result in a spill of more than 58 million gallons of oil into Arctic waters. That's about a quarter of the Deepwater Horizon spill, which put 206 million gallons of oil into the Gulf of Mexico. But it's far more than Shell Oil — the major leaseholder in waters off Alaska's northwest coast — says it could handle under its current response plan. When applying for exploratory permits, Shell was required to prepare for a maximum spill of 231,000 gallons per day. The company says its fleet of on-site responders — including boats, barges, skimmers, and a tanker that can hold 21 million gallons of recovered liquids — can handle a spill of 504,000 gallons per day. But according to the memo prepared by the Alaska office of the Bureau of Ocean Energy Management, Regulation and Enforcement, a worst-case scenario blowout could initially discharge about 2.6 million gallons per day. Shell has consistently said that the chance of a blowout in the area's relatively shallow waters is minimal. Shell Alaska spokesman Curtis Smith said Wednesday the company has not seen the agency's spill scenario. Shell would revise its response plan for wells it wants to drill if the agency required different numbers, he said. "Where the bar is, we stand ready to exceed it," Smith said. However, Shell does not expect wells of the flow rate listed the worst-case scenario for many years into the project, Smith said. 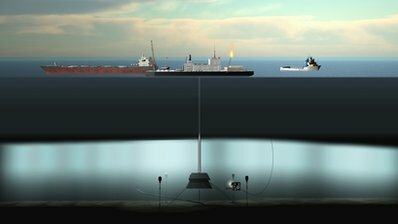 "We do not currently have plans to drill into deep, high pressure reservoirs," he said. The company anticipates drilling in 120 to 150 feet of water to depths of up to 10,000 feet. The Deepwater Horizon rig operated about a mile below the water surface and drilled nearly 3.5 miles below the ocean floor. The discharge at the hypothetical well in the report would decline rapidly as the oil reservoir depressurized and fall to about 790,000 gallons per day after a month, according to the report from the agency formerly known as the Minerals Management Service. But the cumulative discharge over the quickest period estimated for drilling a relief well — a span of 39 days — would mean a discharge of 58.1 million gallons into environmentally sensitive Arctic waters. Shell says it can deploy a containment system within two weeks, including a cap for a subsea blowout and a containment dome. Company officials also have continuously said Shell would ramp up spill response capability as exploratory wells progress into production. Environmental groups opposed to drilling say the federal agency's hypothetical well blowout must be taken seriously. "It's not entirely hypothetical because it's in the lease area," said Lois Epstein of The Wilderness Society in Anchorage. "And we don't have information about where exactly Shell is planning to drill in the Chukchi, nor do we have their own modeling information, which needs to be verified." Shell has spent more than $3.5 billion in Alaska outer continental shelf drilling, including $2.1 billion for leases in the Chukchi Sea in a 2008 lease sale, but has little to show for it because of court challenges or failure to obtain permits. The company in February dropped plans for exploratory drilling in the Beaufort Sea off Alaska's north coast during the short open water season this year after an Environmental Protection Agency review board granted an appeal of Shell's air permit. More than air quality, however, is the fear of that a spill could damage marine waters and the people and animals that depend on them. Environmental groups have said federal agencies have routinely granted permits for seismic tests and other spinoffs of industrial activity that could be harmful to whales, polar bears, walrus and seals already stressed by climate warming and less sea ice. Critics also claim federal agencies routinely accepted oil company claims that the chance of a catastrophic spill in Arctic waters is minimal. The Minerals Management Service, already the target of lawsuits for its decisions in the Arctic, was reorganized and renamed after the Deepwater Horizon disaster. In one of those lawsuits, U.S. District Court Judge Ralph Beistline of Anchorage in July ruled that the federal government failed to follow environmental law before it sold leases in the Chukchi in 2008. Ocean Energy Management officials in March announced that as part of the court-ordered environmental review, they would study how a "very large oil spill" would affect the Chukchi. They also emphasized that calculation of a "very large oil spill" differs from "worst case discharge" at a specific well site picked by an oil company. The improbability of a discharge was not considered in the analysis. Epstein said the worst-case scenario information should make people realize a large spill could occur. "Even in shallow water conditions you can have a spill that is in the same volume range as the Deepwater Horizon range," she said. "Not exactly the same but very close initially, and overall, depending on how many days it goes on, it could be of the same scale." Smith said the company is confident it would not see high pressure and flow rates from initial exploratory wells because of the geologic data it collected during drilling in the Chukchi and Beaufort in the 1980s and 1990s. "Wells that would encounter that kind of discharge are much deeper and typically would come later in a production scenario," Smith said.